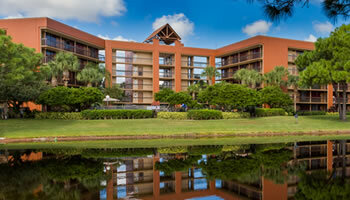 Families look for a number of things when shopping for an affordable hotel in Orlando. They typically look for hotels that are clean, conveniently located, and most of all, reasonably priced. Luckily, Clarion Lake Buena Vista meets all these needs. High standards and unmatched customer service have enabled Clarion Lake Buena Vista to become the best affordable family hotel in Orlando. Clarion Lake Buena Vista aims to bring its customers a comfortable family hotel in Orlando that is located less than 2 miles from Disney Springs™ and the Walt Disney World® Resort. Since Clarion Lake Buena Vista is a Walt Disney World® Good Neighbor partner, free shuttles take guests from the hotel lobby to the main entrances of the surrounding Disney® parks. The hotel also provides affordable ticket packages to Disney® parks so you can avoid the long lines at the theme park ticket booths. We wouldn’t consider ourselves to be an affordable family hotel in Orlando if we didn’t have amenities for kids and adults. There’s Ozzie Splash Zone where kids can play while you relax at the pool. Kids and adults can also enjoy the video arcade game room that never closes and awesome outdoor play area. Our two restaurants, the Boardwalk Buffet restaurant and Comfort Zone Bar & Grille, provide great food at an affordable price right at the hotel grounds. Families will also enjoy the Disney® channel, as well as other premium movie channels. It’s likely that if your family is planning a trip to Orlando, you’re going to shop! This affordable family hotel is close to Orlando’s best shopping, such as the Orlando Premium Outlets®, Lake Buena Vista Factory Stores®, and Disney Springs™. If you’re looking for Orlando’s best vacation value® in a family hotel for your upcoming Orlando visit, look no further. Clarion Lake Buena Vista has the location, service, and amenities that are the foundation for a vacation you’ll never forget. Call 800-999-7300 to make your reservation today.